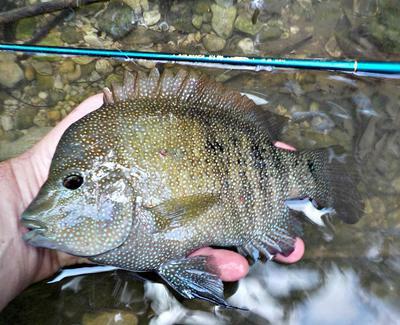 This big Texas cichlid was caught on the Air Stage 240. This past year I’ve purchased fewer tenkara rods but used the ones I have more frequently. Along the way, I’ve identified some favorites. Among my preferred poles would be the Nissin Air Stage Hakubai 240, which is a pure delight for little streams and small fish. Some months back I wrote an article about the 240 and described it as a great micro-fishing rod. I still believe that’s true. Incredibly light at only .6 oz., amazingly sensitive, and beautifully-engineered, it’s pure pleasure in the hand and on the water. I’ve fished it dozens of times now, and it’s hard to lodge a complaint. It does have a fairly long collapsed length of 23 5/8”, but that’s nitpicking. I prefer to carry the rod in one of the TenkaraBum stretchy socks instead of the Nissin cloth pouch. Now that I’ve used the rod for a while, three points stand out in my mind. First, it’s my favorite rod when I want to pick my way along a small, tight creek, with lots of cover, populated by smaller fish. This isn’t the first rod I’d recommend for a novice, but it’s unsurpassed for gliding along the neighborhood creek or tiny stream, in super-tight casting quarters. It doesn’t have the backbone to fight bigger fish, but it does have the sensitivity to enjoy even the smallest catch. It provides an unmatched fishing experience in the right circumstances. Chubs, shiners, “micro-bass,” and tiny bluegills become great fun. Second, it’s more durable than I first imagined. Because the rod is so light, almost delicate, I feared that I’d quickly bust mine, even with ultra-light tippet. Used with care and sense, however, and respecting what it’s designed for, the Hakubai has never let me down. I included the photo of the big Texas cichlid above to show that it’s more capable than one might imagine. It won’t take abuse, but it will stand proper use. Finally, the 240 casts wonderfully well. And, because of its abbreviated length, you can fish it almost anywhere with a slingshot cast. Whoever designed the 240 got the balance and bend just right for a short, light rod. For these reasons, and more, the Nissin Air Stage Hakubai 240 is a real keeper. John - Thanks for the review. It makes me want to put that rod on my "list." If I get into fishing more streams where a less than 2.5 meter rod is my "go to" rod, I may upgrade from the two 240's I already have. We all have different environments we fish in. It seems I am always pulling out a 4 meter or longer rod where I fish. It is always much more of a joy catching fish on a premium rod like Chris offers. I was fishing Wilson Springs three weeks ago with my Tenyru Spectra Spinning outfit and casting a good 15 to 20 yards to get to the fish. The guy I was sharing the fishing platform with, was extolling the virtues of his Zebco Dock Demon Deluxe. However he wasn't catching any fish. He could only cast a light outfit about 15 feet, plus his drag was so poor he lost the two fish he did hook! I never comment to a person on his or her set-up or outfit. Especially if he is having fun. This poor guy wasn't having fun after about 10 minutes. When I told him I had to go to work, he asked me what I did. Usually, I tell folks I am a "chaplain." In his case, I told him I was a "minister." He turned all red and began to apologize for all of his swearing. Yes, it was a bit passive-aggressive, but is sure was fun! Since he was driving a rig worth at least 3 times what I drive, I gave him one of Chris' cards and told him he ought to check out some premium fishing gear. If he had been having fun I wouldn't have said anything. Having great fishing equipment sure enhances the experience. Thanks Chris! Thanks for the comments. 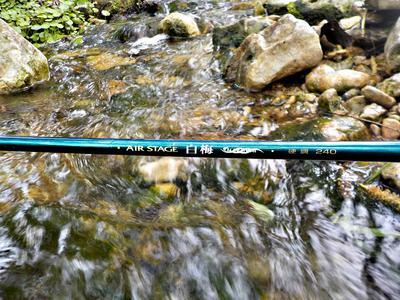 The Air Stage 240 is definitely a rod for special situations--small water and small fish. But, for its intended purpose, it's hard to beat. Still waiting for the return of the 190 as are many others. Nissin, are you listening?